The Sacrament of Communion is always a special and solemn occasion for self reflection and prayer. 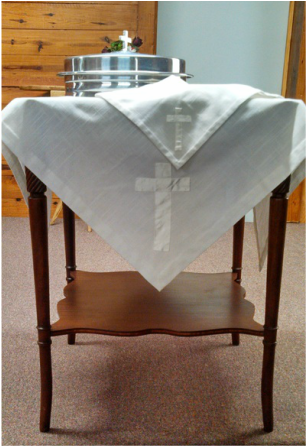 This week, it was an extra special event because it was the first Communion served by our newly ordained deacon Terry Miller. Terry is pictured above on the left with Pastor Joshua Strong and Deacon Donnie Strong. Grant Strong, who is our Pastor's little boy, celebrated his 3rd birthday on Tuesday. Today, he got to put his money in the "little church" bank. What a grin while we sang Happy Birthday just for him! This month's Fifth Sunday Fellowship coincided with Pastor Appreciation week. The church bought a lovely, and delicious, cake to celebrate. 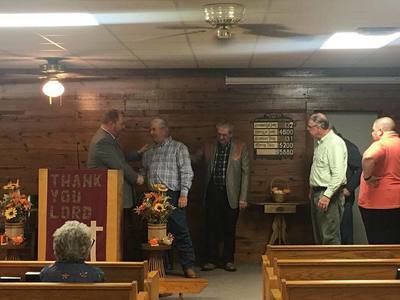 We surely do appreciate Pastor Strong and all he does. 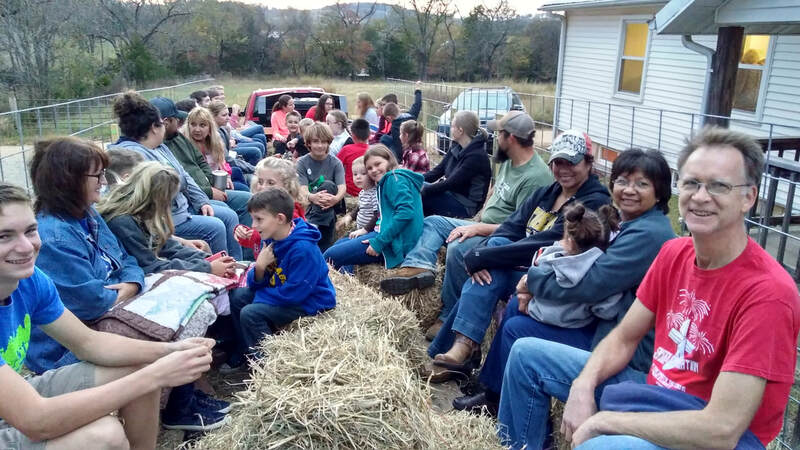 On Saturday, October 21, we held our annual hayride. Hot dogs, chili, hot cocoa, cider, and of course, S'mores! 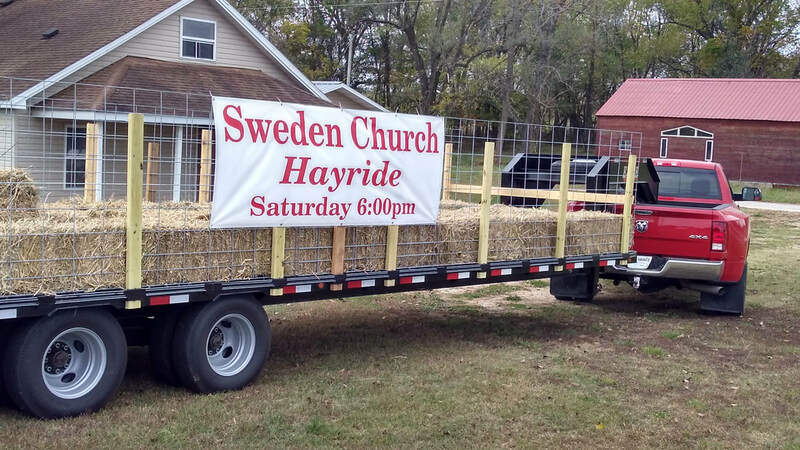 ​A big trailer full of hay made a trip around the neighborhood filled with young and young-at-heart. 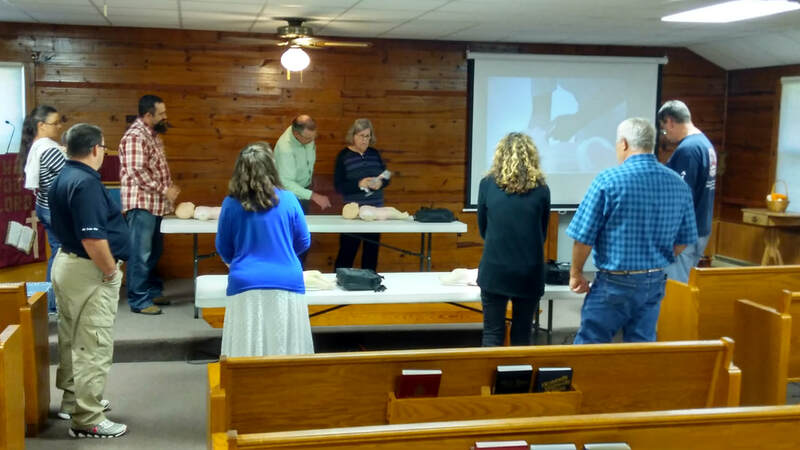 On Sunday, October 15, 2017, we were grateful to have flight paramedics Todd Vanatter and Jerry Fuller come and teach a CPR course for a few our folks. 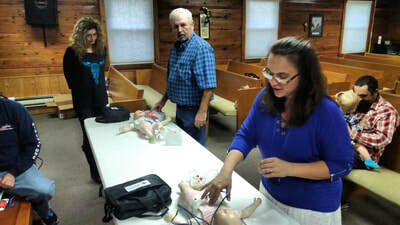 ​We hope to schedule more classes in the future for anyone interested in getting CPR certified. September 17, we wished Happy Birthday to Claire Fosset, who turned 16, and to our pastor's baby girl Ellie, who turned one (Claire is holding Ellie). Both celebrated last week. Tara Fossett, Claire's mom, will have a birthday in the coming week. Happy Birthday to all of you. You bless us here at Sweden. ​​September of 2016 was bittersweet for us here at Sweden. We had to lay to rest our beloved deacon and friend Brother Tom Johnson. God saw fit to take him home on September 16. ​Earlier that same week, on September 14, our pastor's family welcomed their newest member, baby Ellie Marie Strong. Ellie came home from the hospital on the same day that Tom moved home to Heaven. In such a short space of time, we experienced the heights of both joy and sorrow. We thank God for the example Tom's life is to all of us. If we follow that godly example before Ellie and all of our children, surely we will not lead them astray. 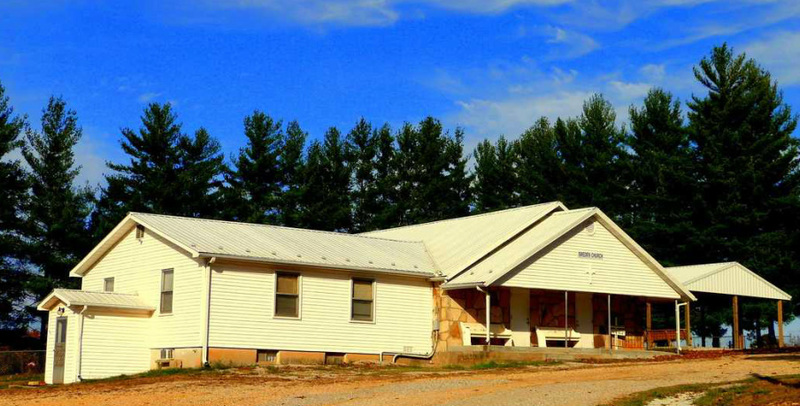 The church building was erected in 1947, the lovely pavilion in the background, in the summer of 2012. This beautiful photo is courtesy of Nathaly Sherrill. To be a father is a high calling. We think our dads are up to the task! 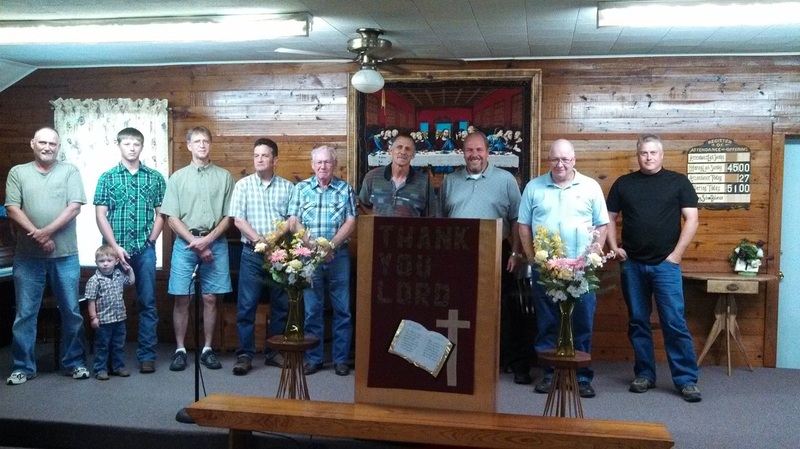 From left to right: Stanley Clark, Fisher Bray and his daddy Zach, David Koch, Dennis MacDonneil, Wayne Anderson, Mike Loftin, Pastor Joshua Strong, Donnie Strong and Troy Tredway. 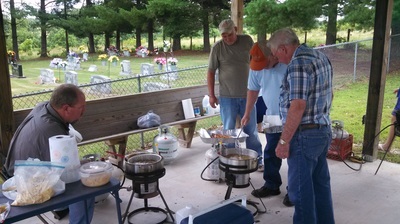 Folks enjoy fellowship as they wait patiently for the fish to cook. 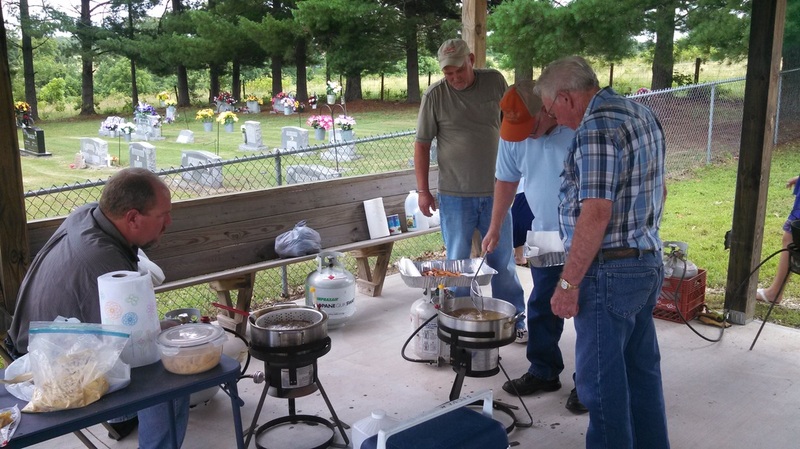 How do the dad's end up cooking at the Father's Day Fish Fry? 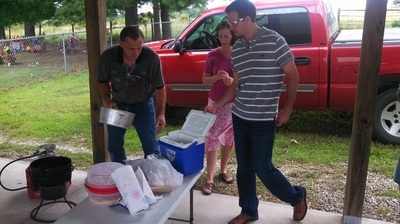 Mike, Lisa, and Westin Loftin make the fish fry a family affair. Communion is always a special event in a church. On Palm Sunday the service was even more so because it was the first served by our newly ordained deacon Bro. Tom Johnson. 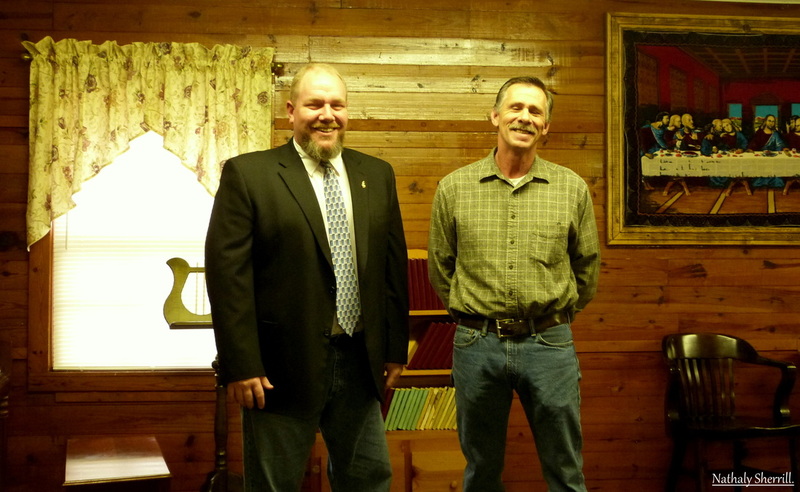 Tom is pictured here on the right with Deacon Donnie Strong. On Thursday nights, we have just a few kids, but they love to "draw swords." Patrick MacDonneil, Erika Strong; and Zoey Strong have their heads down as they search diligently for the required verses. The the one who finishes first most often gets first grab at the prize bag! "And when they had prayed, they laid their hands on them." Acts 6:6. The laying on of hands to ordain deacons is a tradition that began with the Apostles. 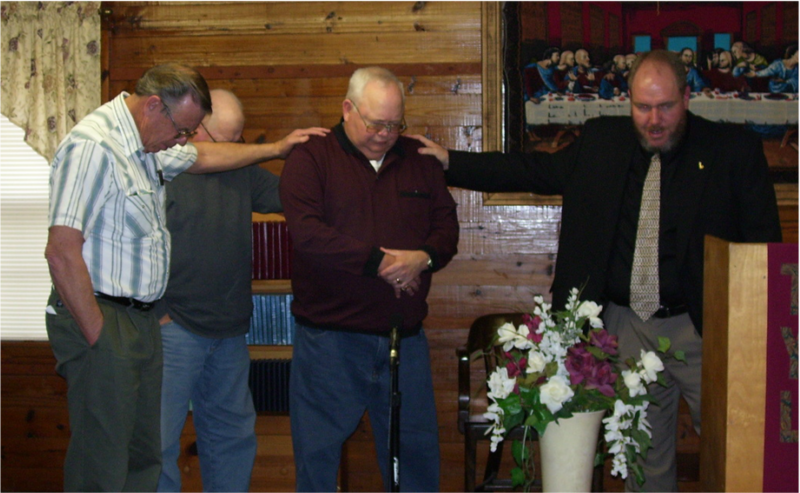 Our ordained members are Brother Marvin Loftin, preacher; Brother Donnie Strong, deacon; and Pastor Joshua Strong. These men laid hands on Brother Tom Johnson, praying for God to bless him as he takes on the duties of a deacon. 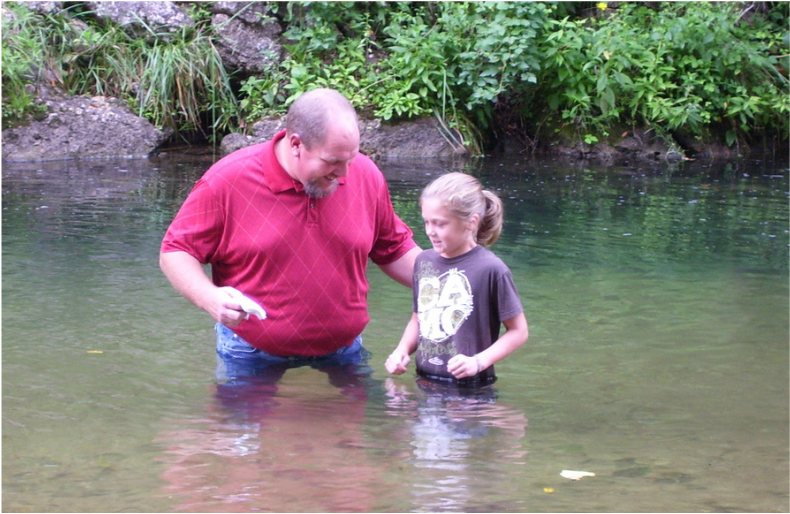 Celia Fossett publicly professed her faith in Jesus by being baptized. 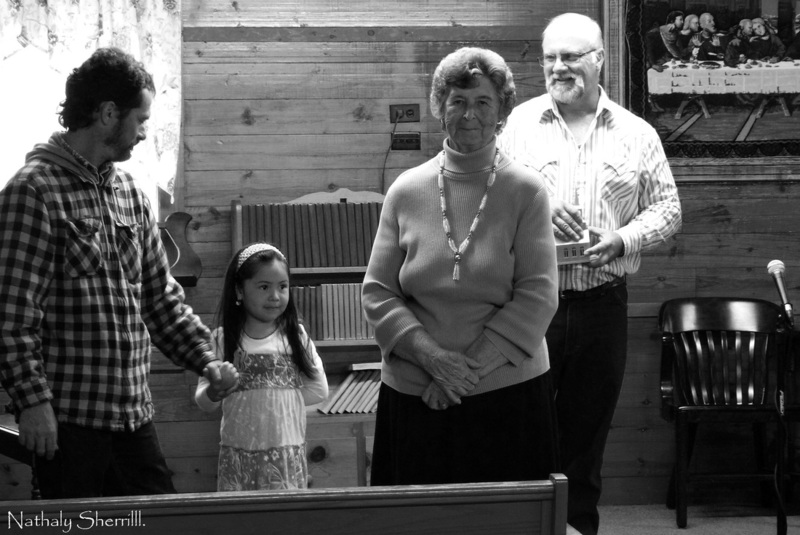 Celia is a wonderful girl, and we are blessed to have her as a part of Sweden Church. We had an amazing Mother's Day at Sweden. First, we celebrated all our moms. What a blessing they are to us. Next we opened the doors of the church and welcomed 8 new members! Yes EIGHT! We finished our worship service at the creek! 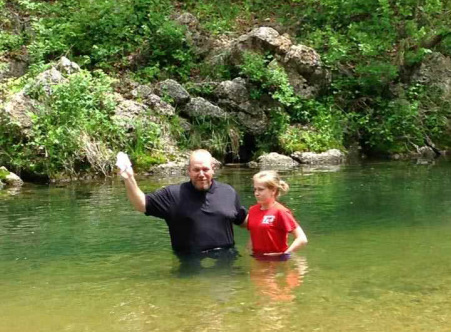 Claire Fossett received Christ as her Savior during summer camp in 2013, and decided to be baptized. Our cup of blessing is simply overflowing. Praise the Lord! Sweden's Moms: Marie Dean, Courtney Davault, JoAnn Anderson, Deborah Endicott, Brenda Strong, Barbara Ridenour, Tara Fossett, Ciara Bray, Terri Fossett, Linda Johnson, Connie Miller, Carol Evans, Marni MacDonneil, Andrea Strong, Karen Koch, Lyda Wheat, and Lisa Loftin. The crowd patiently awaits the beginning of the festivities. Pastor Joshua Strong narrates "Noah's Easter Story" the children's portion of the day's presentation. Connie Miller awaits her cue to play. Claire Fossett and Lyda Wheat deliver their lines beautifully! Ethan Koch, Andrea Strong, Emmaline Koch, Elizabeth Treadway, and Marni Macdonniel perform "The Easter Planning Committee." 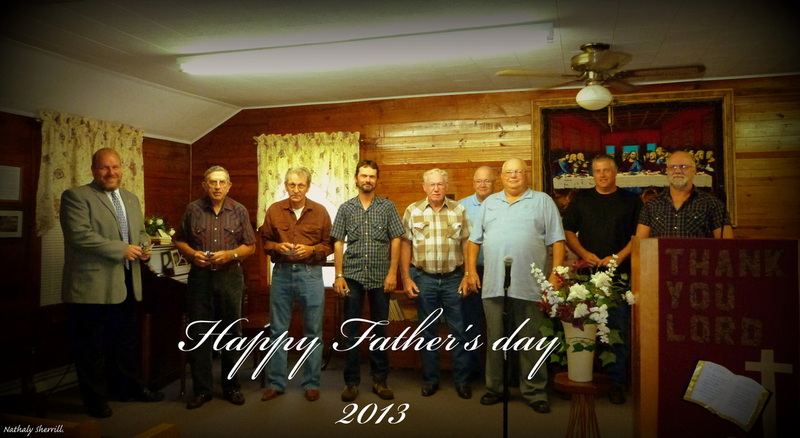 We celebrated our fathers today. 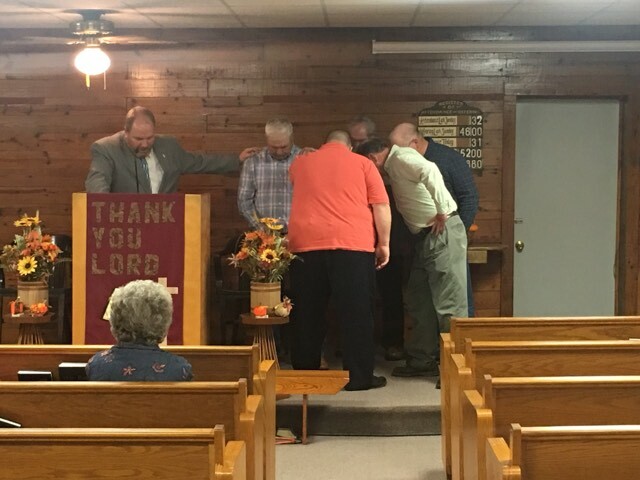 Pastor Joshua Strong, Jack Wheat, Gib Miller, Brian Sherrill, Wayne Anderson, Donnie Strong, Tom Johnson, Troy Tredway, John Evans. We thank God for you all! Andrea Strong celebrated her birthday today. Guest of Honor, Nathaly Sherril, US Citizen. We are SO proud of her! 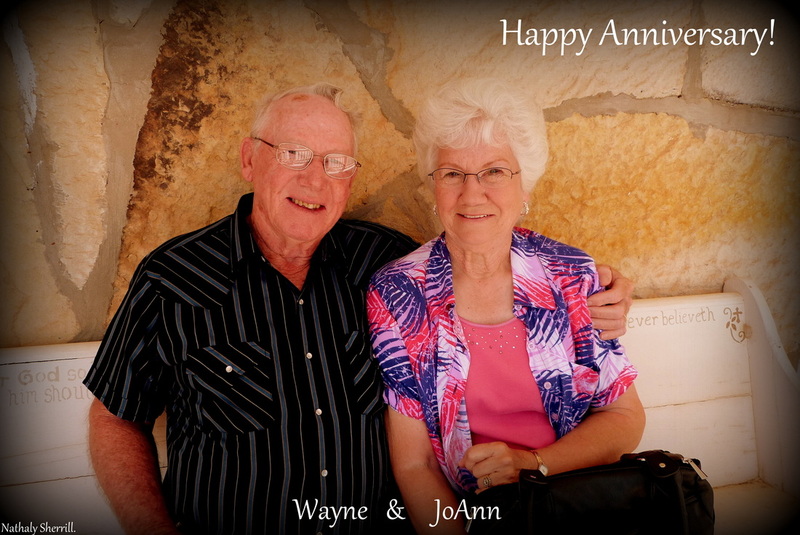 Wayne and JoAnn Anderson celebrated 57 years of marriage this week. 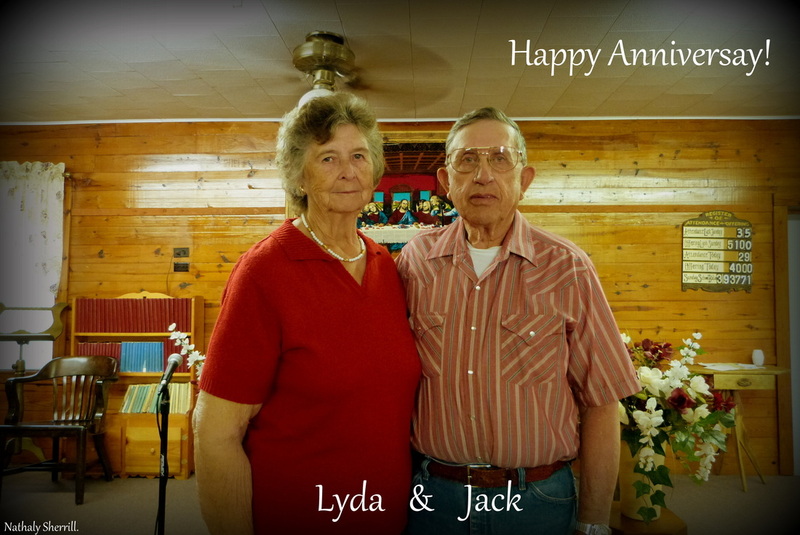 Jack and Lyda Wheat celebrated 59 years of marriage this week. We praise the Lord for all our Mothers! Sue Byerly, Tara Fossett, Barb Ridenour, Connie Miller, Joanne Anderson, Brenda Strong, Debbie Endicott, Fern Bishop, Marie Dean, Linda Johnson, Carol Evans, Lisa Loftin, Karen Koch, Lyda Wheat, Sherry Pennell, and Andrea Strong. 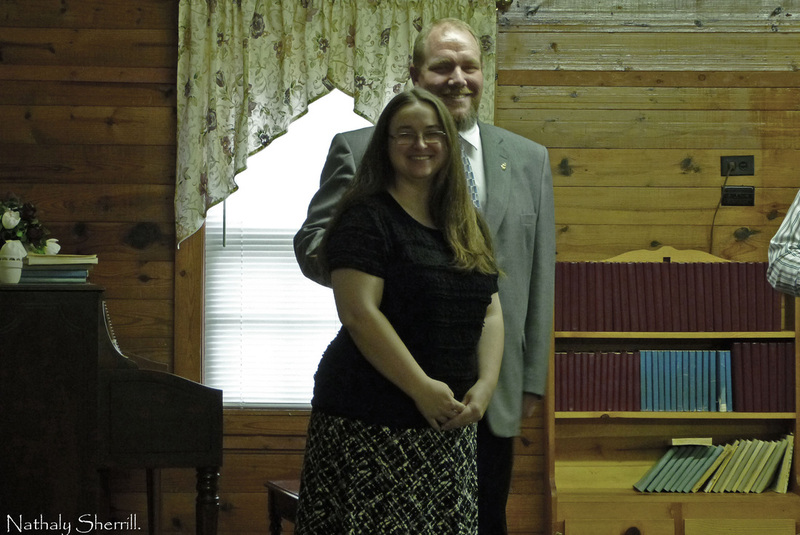 Pastor Joshua Strong and wife Andrea celebrated their 12th Anniversary on Sunday. Silvana Sherril turns 6 years old this week. Sister Lyda Wheat also had a birthday. 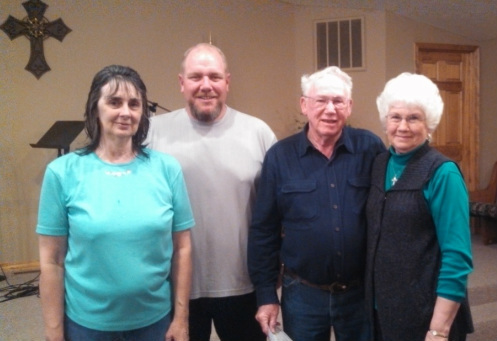 Sister Debbie Endicott and Brother Wayne Anderson chose to follow Jesus's example in baptism on Sunday, April 7, 2013. 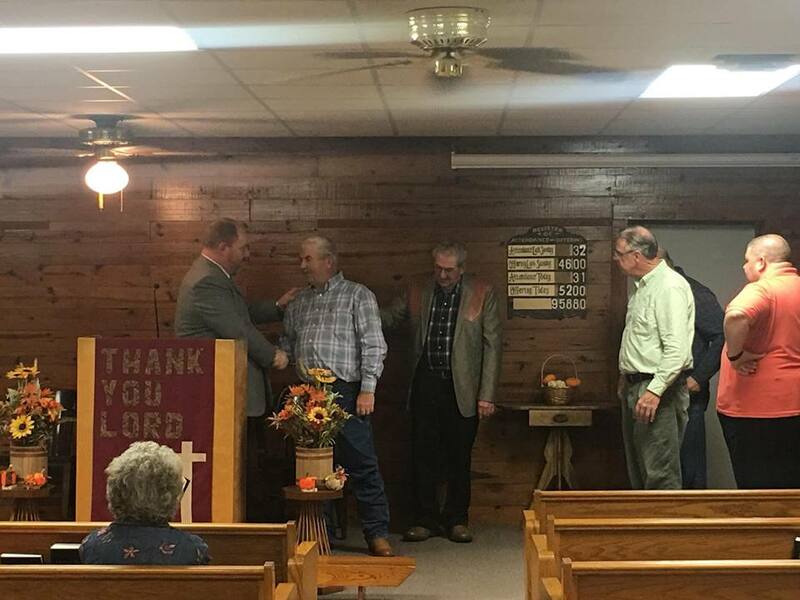 Pastor Strong had the great honor of performing the service. 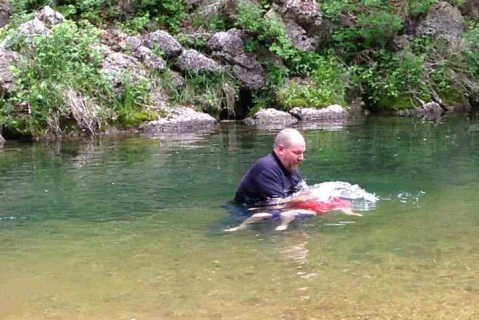 Many thanks to Walnut Grove Church for the use of their baptistery. 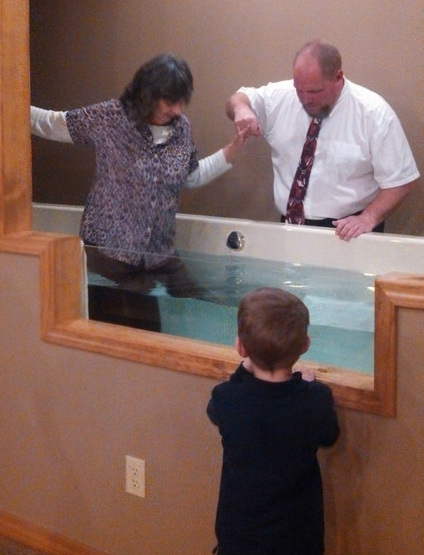 Pastor Strong helps Sister Debbie Endicott into the baptistery as Debbie's grandson Levi looks on. 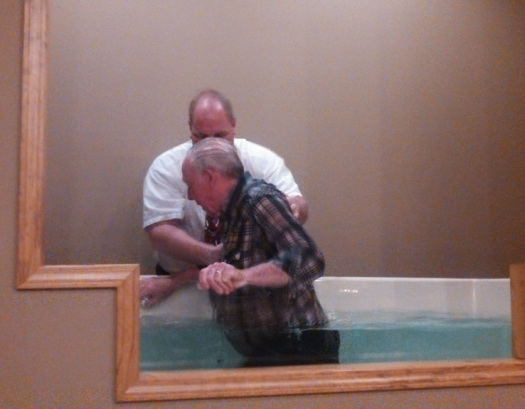 Pastor Strong assists Brother Wayne Anderson up from the baptismal waters. Sis. 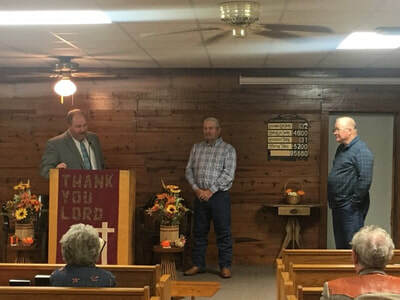 Debbie, Pastor Strong, and Bro. Wayne with Wayne's wife Joanne. 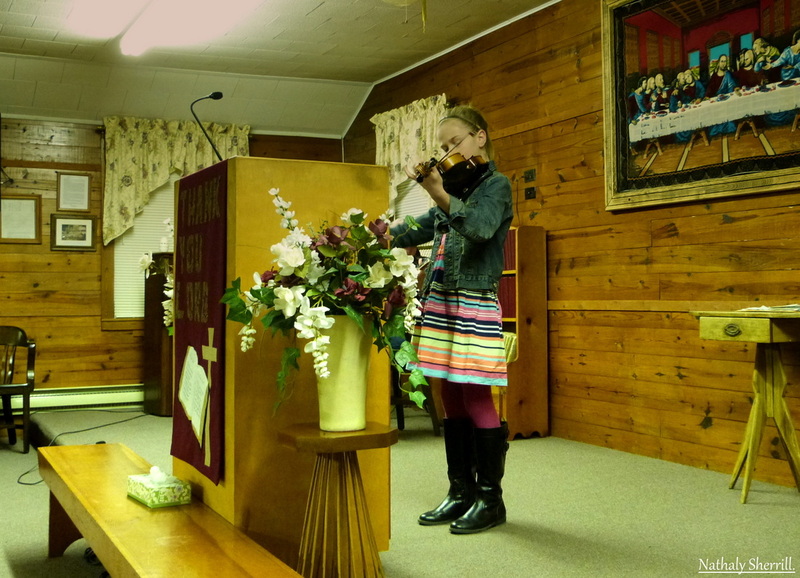 Claire Fossett on the fiddle. 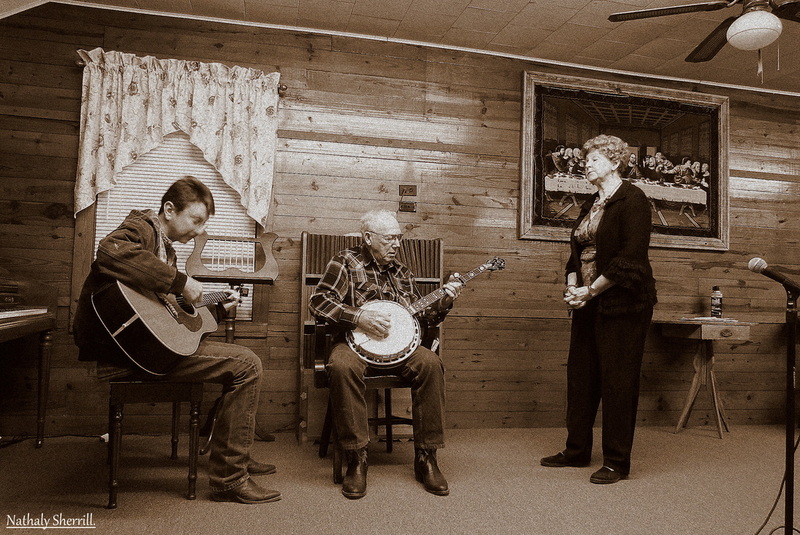 Connie Miller singing to the accompaniment of Wayne Anderson on the banjo and Todd Miller on the guitar. Little Erika loves to sing with Mommy! 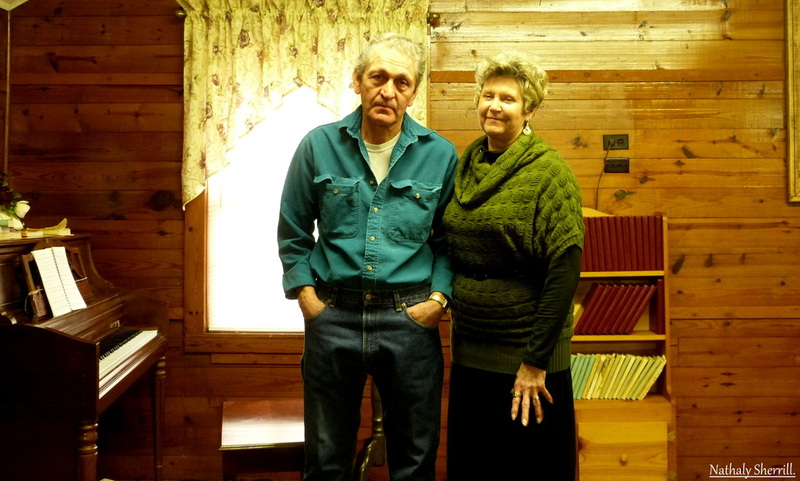 2/10/13 Gib and Connie Miller celebrated their anniversary this week. 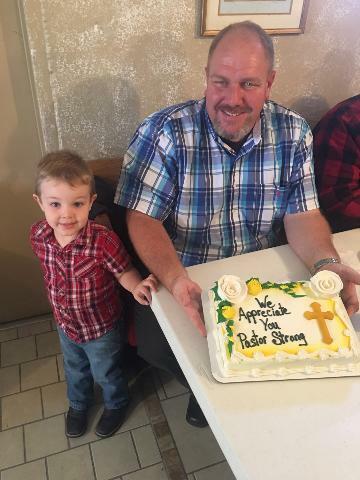 Pastor Joshua Strong celebrated his birthday today. 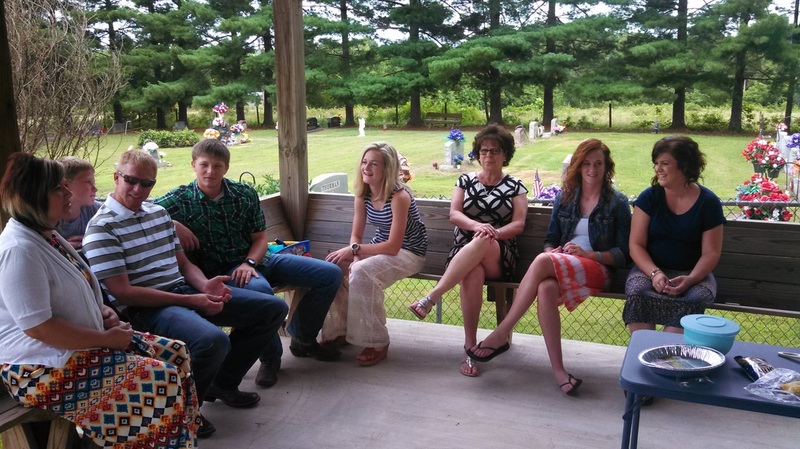 Mike Loftin celebrated earlier in the week. 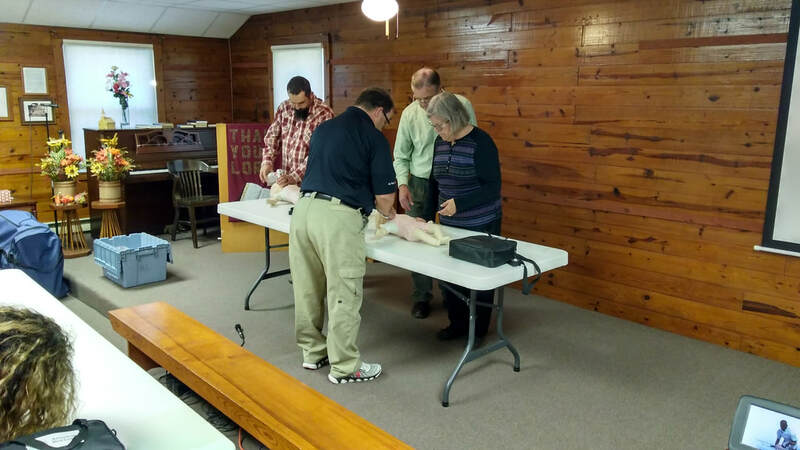 Joanne Anderson celebrated her birthday with Jesus on December 25. Tom and Linda Johnson celebrated their anniversary in December. 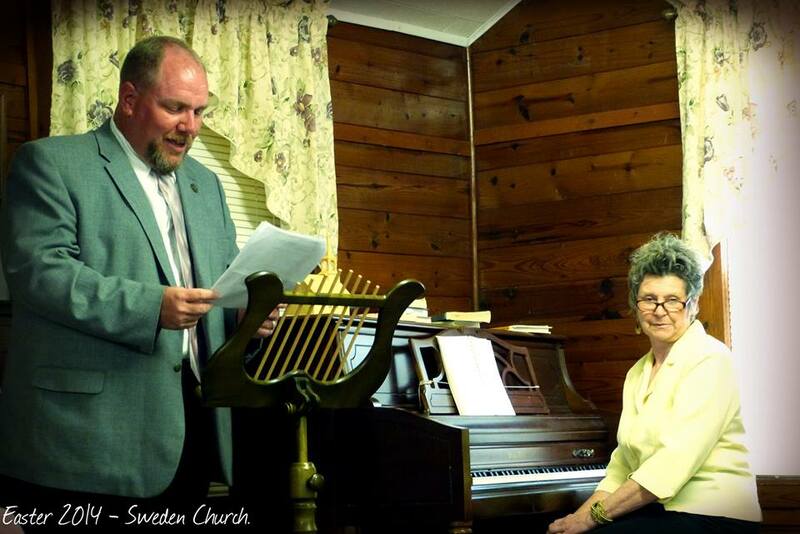 Tom has served as Superintendent for us, and Linda is our reporter for The Layman's Pen. Celia Fossett, Silvana Sherrill, and Erika Strong sing "Away in a Manger." We at Sweden Church would like to thank the members of our community who supported our bake sale on October 20. These donations would not be possible without your generosity. 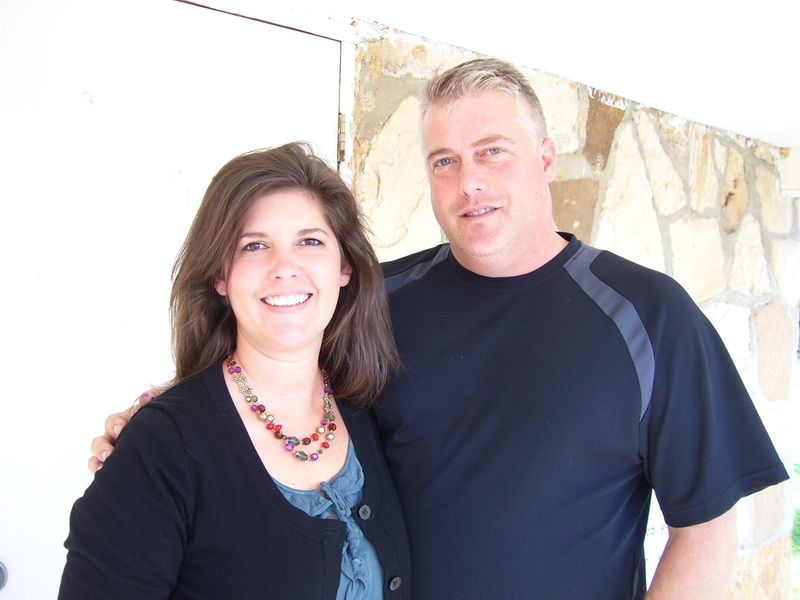 Left to Right: Andrea Strong is the wife of Pastor Joshua Strong. Crystal Miller teaches at Ava Victory Academy and attends Sweden Church, Teresa Bruffett is Administrator of Ava Victory Academy. 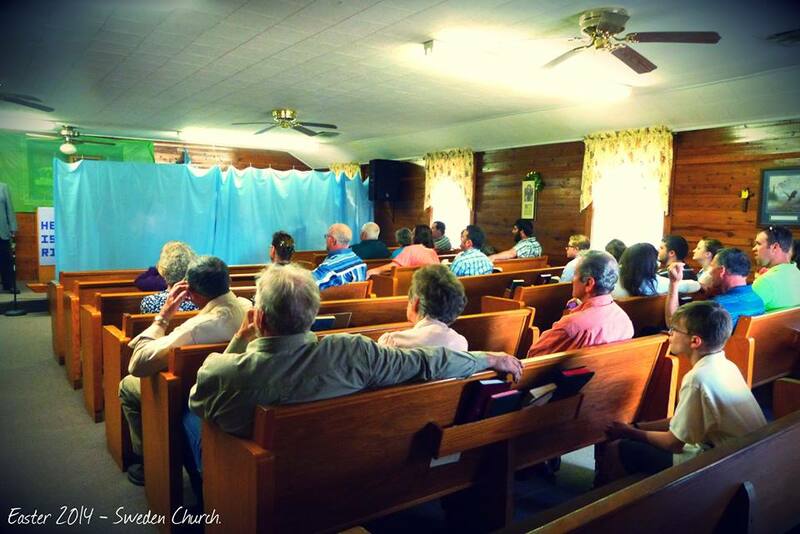 The Church is made up of people. 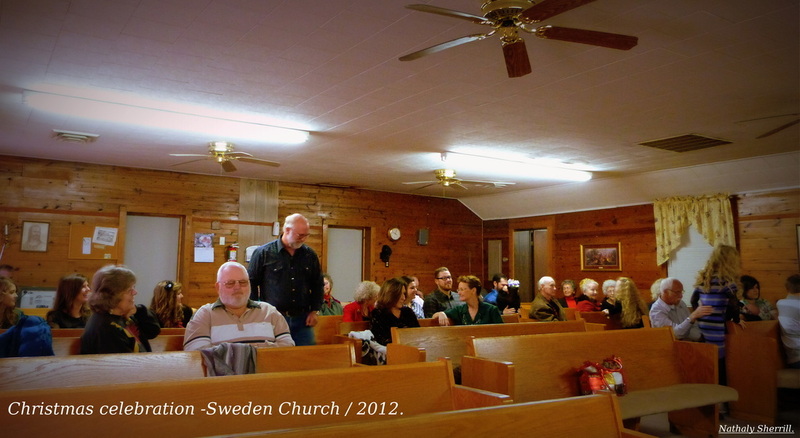 Here are some of the people who make Sweden Church the wonderful place it is. Brian and Nathaly Sherril. Nathaly is our Photographer. Troy and Jeanie Tredway celebrated their 23rd Anniversary. Gib and Connie Miller. 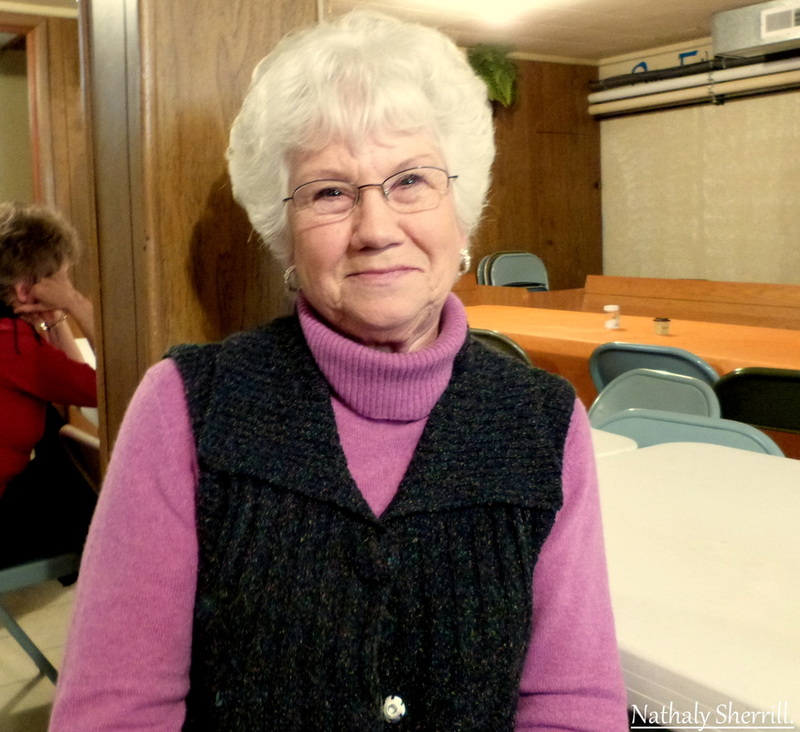 Connie is Sunday School Secretary. We raised $469.00 for our charities, Options Pregnancy Center and Ava Victory Academy. 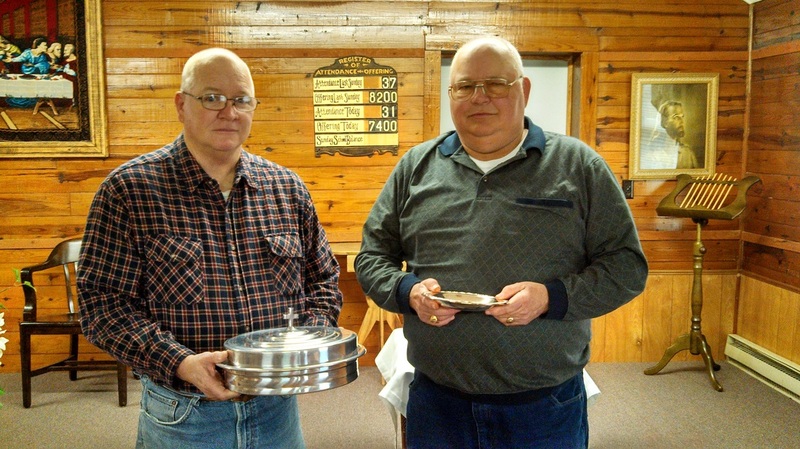 Church folks don baker's and salesmen's hats for a couple of good causes.